There are no magic tools when it comes to training horses. However, there are tools that will make your job a lot easier and help to minimize frustration on both you and your horse’s part. That’s certainly true of the trick bridle. It offers much more leverage than a halter, and is especially useful when teaching tricks where the horse is initially resistant. The basket stamp trick bridle features a basket stamp headstall, a snaffle bit, one- or two-piece slobber straps, a leather curb strap and 8-foot loop reins. We recommend pairing our chestnut curb strap and basket stamp slobber straps with the basket stamp headstall for a clean, classy look. The loop reins are made out of high-quality, marine yachting rope. They are durable, soft in your hands, and they won’t get slippery if they get wet or sweaty. 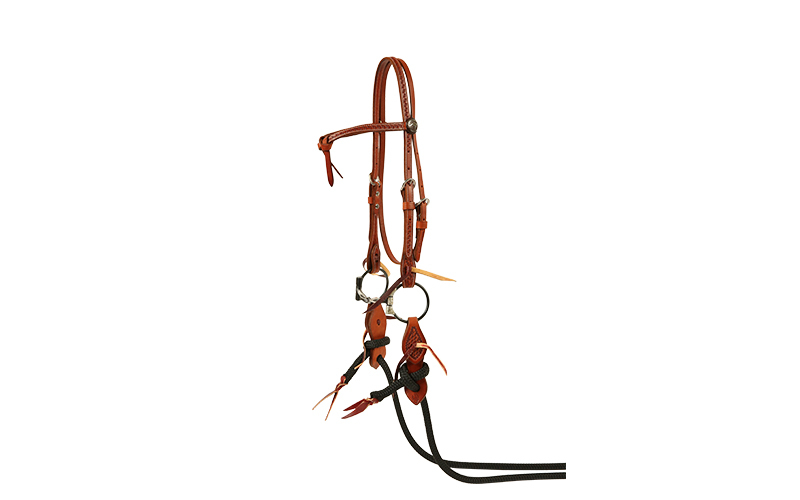 The 8-foot length of the reins offers just the right amount of slack for teaching your horse tricks. Reins that are longer create too much slack, which makes it difficult to manage the reins. 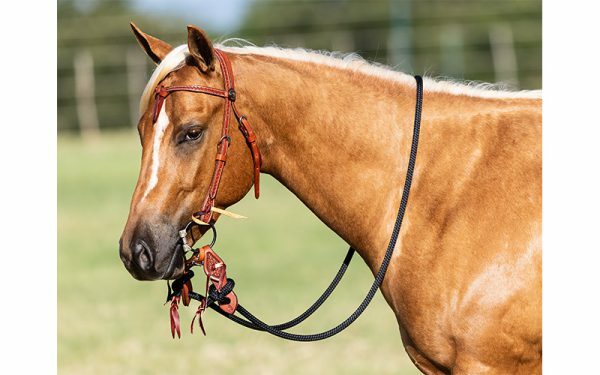 Please note that during the teaching stage of the tricks you’ll need to use both a lead rope and the trick bridle to encourage the horse to lie down or bow. It’s helpful if these two pieces of equipment are in different colors so that you don’t get confused about which one to cue the horse with.